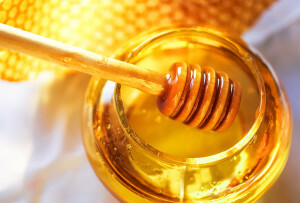 Used by both Cleopatra and the ancient Chinese, honey has long been celebrated as a miracle salve for the skin. Made of about 80 percent sugar, honey also contains minerals and trace elements such as iron, calcium, phosphorus, magnesium, amino acids, vitamins and water. It is often used in recipes for acne treatment, reducing eye puffiness, exfoliating scrubs and eczema. Honey’s natural antioxidant and anti-microbial properties help to protect the skin from the damage of the sun’s rays, supporting the skin’s ability to rejuvenate and refresh depleted skin, leaving it feeling silky soft and supple. Moisturizer: Honey is a natural humectant, meaning that it attracts and retains moisture – a perfect fit for dry winter skin! Apply a thin layer of raw honey to slightly damp skin using a circular motion. Leave the honey for at least 30 minutes and then gently rinse it off with warm water. Antioxidant: Honey contains antioxidants that help fight free radicals. Antioxidants can protect both the skin and internal organs from a type of damage called oxidative stress. You can gently exfoliate your skin once or twice a week with a mild scrub made with two parts honey and one part baking soda. It works wonders on hands and feet as well! Anti-Irritant: Honey is especially helpful at calming irritation, thanks in part to its antibacterial and anti-inflammatory properties. Have a blemish? Place a small amount of honey onto a cotton swab and dab onto your spot. You can also mix the honey with tea tree oil and lavender oil for additional natural cleansing. Natural and at-home treatments, including those with honey, can be beneficial, but nothing can take the place of professional skin care! Call us for a consultation, or schedule your appointment online today.